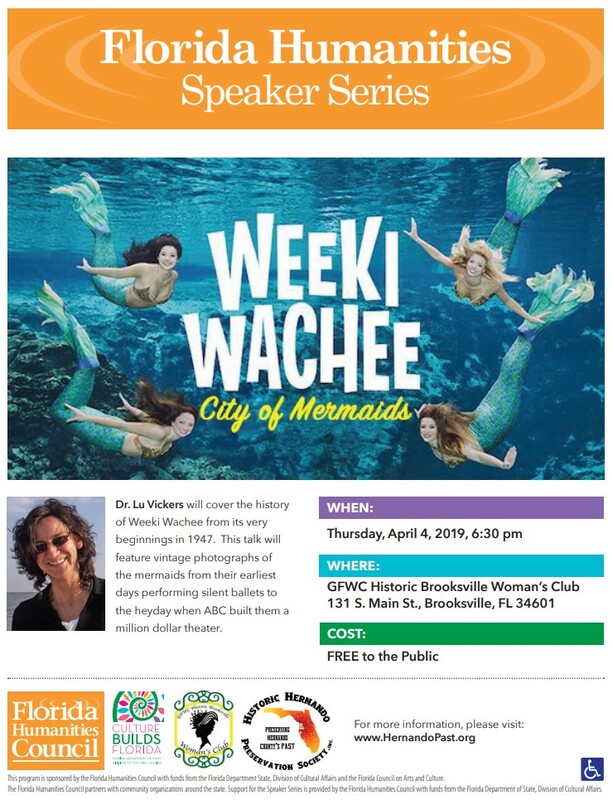 The Historic Hernando Preservation Society and Gulf Archaeology Research Institute will be meeting with the Brooksville City Council on Monday April 15, 2019 @ 7:00 p.m to present the Research Design for the CHOCOCHATTI project and to gain the approval of City Council to conduct studies on the city’s property. If you wish to attend, it would help show support for this archaeological project which will benefit the future of our community. CHOCOCHATTI is a unique historical-cultural resource which must receive our utmost efforts of archaeological research and preservation. MONDAY: April 15, 2019 @ 7:00 p.m. The City of Brooksville is now accepting nominations for the 2019 “Great Brooksvillian” Award. This annual program recognizes the outstanding men and women who have made significant positive contributions to the history, culture and/or economy of our great community. Each year the Brooksville City Council will make a selection from the nominees. 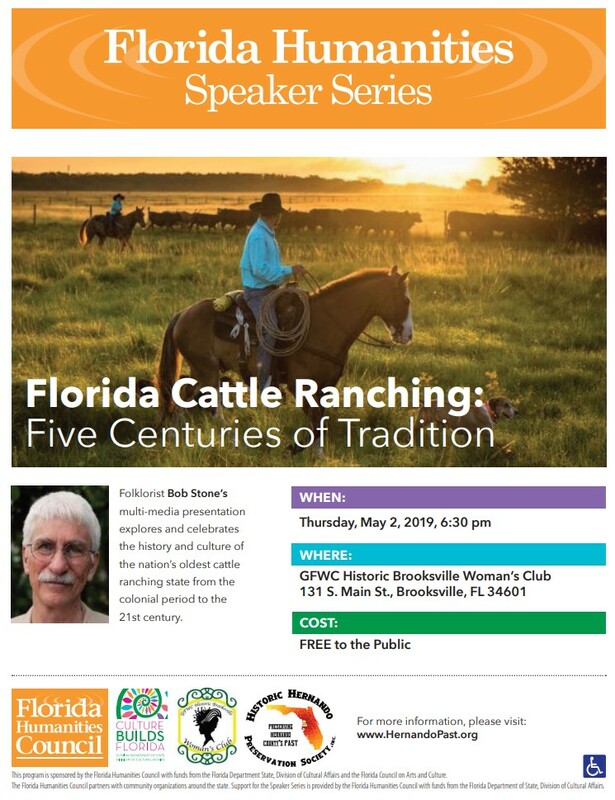 A perpetual plaque will be maintained in Brooksville City Hall to commemorate and memorialize each year’s honoree, and an individual plaque will be presented to the honoree and his/her family at a reception held in their honor. Information, program criteria and nomination forms are available for download on the City’s website at www.cityofbrooksville.us. Or stop by City Hall (201 Howell Avenue) or the Jerome Brown Community Center (99 Jerome Brown Place). Deadline for submission of nominations is Friday, June 07, 2019. Completed forms must be received by the City Clerk no later than 5:00 p.m. For further information, contact the Office of the City Clerk, Deputy City Clerk, Sandra Kirby, of Brooksville, Florida at (352) 540-3853, or by email: skirby@cityofbrooksville.us. 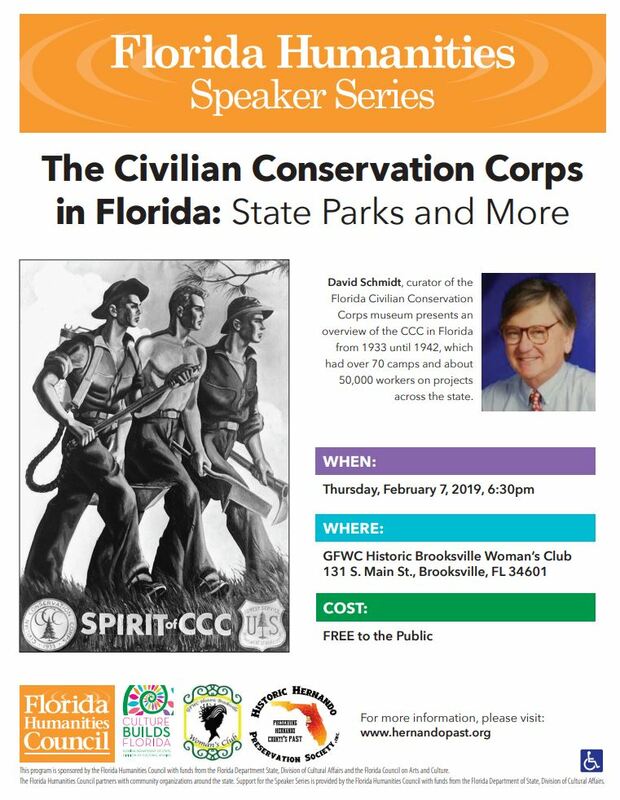 A very important Public/Community Meeting is scheduled for Wednesday, March 6, 2019 @ 6:30 pm at Brooksville City Hall located at 201 Howell Ave, Brooksville, FL 34601. This meeting is open to the public & all residents of the area in order to meet with archaeologists from GARI, Gulf Archaeology Research Institute www.gulfarchaeology.org to learn from you any information that would benefit in understanding CHOCOCHATTI “Red House.” Studies on this Florida Historic Landmark Site will be conducted from 2019-2020. They will also discuss their research design and scope of studies anticipated in the upcoming months. 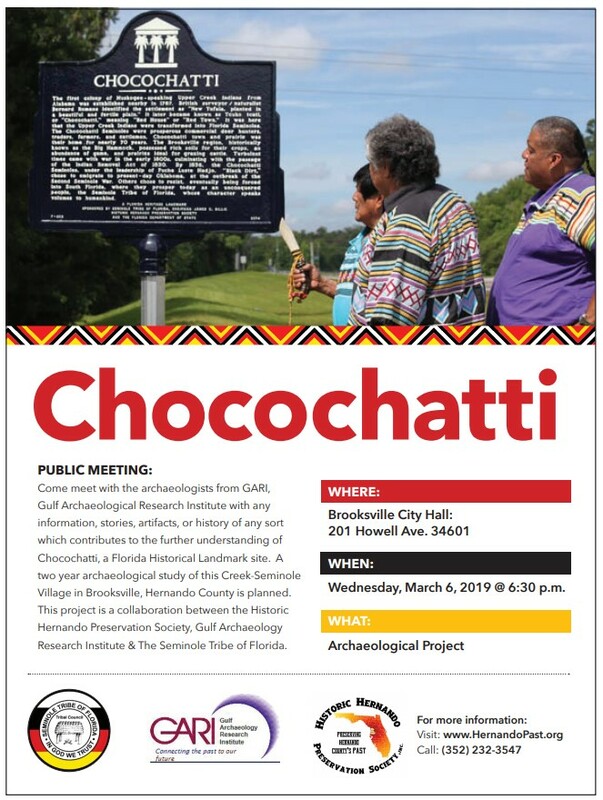 The Seminole Tribe of Florida Tribal Historic Preservation Office www.stofthpo.com will also be participating wih GARI in this most important research of Chocochatti. We look forward to seeing you then! 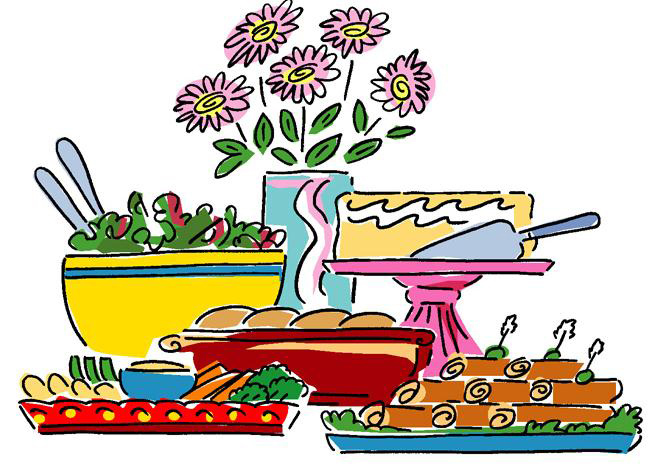 Join the HHPS for the 2019 First Quarter Business Meeting to be followed with a Pot Luck Supper. We will discuss upcoming projects and plans, as well as scheduled speakers. All are welcome to attend!